The Kremlin, buoyed by its success in helping the Assad regime stave off collapse, is trying to pull off a similar trick in a troubled part of America’s backyard: Venezuela. The Trump White House is having none of it, but a new stage is being set for U.S.–Russia confrontation. The big picture: Putin is less interested in President Nicolás Maduro and his regime than in using him as a thorn in Washington’s side. Venezuela’s crisis provides Putin with a like-minded collaborator eager to denounce the U.S.
Vice President Pence had called for a delay ahead of Venezuela’s election this past Sunday on grounds of expected fraud. The Trump administration has used a combination of diplomatic pressure, together with other Latin American governments and Europe, and tough sanctions to isolate and push Maduro into compromising with his opponents. Sanctions: Moscow has long opposed sanctions as a foreign policy tool, especially from the U.S., which has recently levied several waves of individual, corporate and sectoral sanctions against Russia. The U.S. stepped up pressure on Maduro this week, announcing new sanctions that prohibit the purchase of Venezuelan government debt. 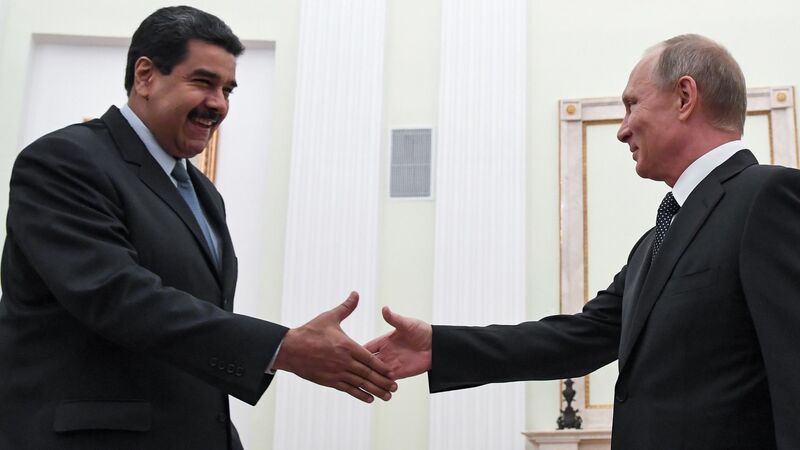 Multipolarity: Moscow chafes at U.S. global leadership, and Maduro presides over a ruined economy while looking for a financial lifeline that circumvents Western institutions and sanctions. Together, the two countries look to build alternatives, such as this year’s lackluster launch of the Petro, Venezuela’s digital currency. Authoritarianism: Moscow and Caracas share an aversion to genuine democratic governance, ruling by sidelining opposition candidates, enriching their inner circles at the expense of the public good and running sham elections. Anti-U.S. stance: In recent months, Maduro and Putin have flaunted their mutual support in the face of U.S. pressure, blaming U.S. sanctions for their economic problems and using them to whip up domestic support. Money: Russia’s state oil company Rosneft has been making loans to Maduro in exchange for stakes in Venezuela’s oil. As long as Maduro is in power, Rosneft’s investment looks good. Why it matters: If Moscow is successful in bailing out the Maduro regime, it will secure its foothold in the region. Julia Gurganus is a visiting scholar with the Russia and Eurasia Program at the Carnegie Endowment for International Peace. She is an employee of the Central Intelligence Agency on a sponsored sabbatical, but all statements of fact, opinion or analysis are those of the author and do not reflect the official position or view of the U.S. government or an official release of U.S. government information.